Happy Friday! I hope you’ve enjoyed soup week. I really do make all of these soups all the time. We also make chicken-tortilla soup, chili, and plain old chicken noodle often. The frequency with which I serve soups is why I go into recipe withdrawal when it gets really hot around here. Maybe I should start working on my gazpacho-making skills. We’re finishing up the week with one of Pioneer Woman’s creations. As with other PW recipes, this one is not going to win any healthy-eating awards. But it is warm and comforting and it made my kids not fear kale anymore. Prepare the kale and set it aside. In a large pot, crumble and brown the Italian sausage. Drain as much as the fat as you can. In same pan, cook diced onion until tender. Stir in the red pepper flakes, oregano, chicken broth, milk, and half-and-half. Simmer for 30 minutes. My maternal grandmother — the dairy farmer’s wife — is the source of this recipe. It’s the soup that my mother brought to our freezers when my sister and I were having babies. It freezes well. It’s easy to double, triple, or quadruple the recipe if you find the need to. And I’ve added some notes at the bottom for variations. In a large pot, brown the meat. Drain, return to pan. Add 6 C water and bay leaf; simmer for 30 minutes. Add all other ingredients and simmer for 30 minutes more. I almost always up the broth amount and add more veggies and barley. Also, you should try adding other veggies. Frozen corn, frozen peas, chopped zucchini, and bell peppers would all work nicely here. My grandmother uses barley, my mom uses rice, I use barley. It tastes good either way. If you want to use your crockpot for this recipe, you can. Just brown the meat ahead of time and then throw everything else in together. This recipe requires good old-fashioned bouillon cubes. If you use a stock concentrate like I do, you will need to add salt. I actually keep bouillon cubes in my cabinet just for this soup. Two weeks ago I made my own yogurt for the first time. I used the Crockpot Lady’s guide. I understand that there are faster ways to do it using a pot and a stove, but I really enjoy this method because you don’t have to pay a whole lot of attention. It’s as easy as turning on your crock pot, turning it off, and then some simple mixing. 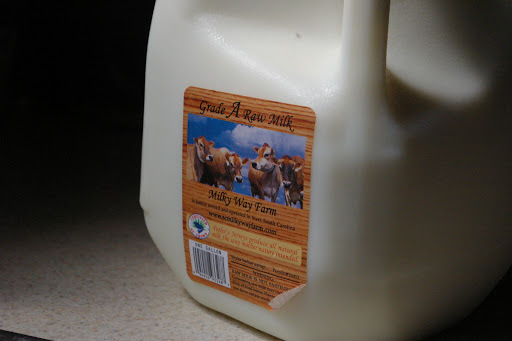 You get extra points if you use raw milk, did you know? My friend Jennie orders and delivers this good stuff to me every couple of weeks. I can’t afford to have my kids drink it all the time, but I figure some is better than none, right? The yogurt recipe uses a half gallon. Here’s the yogurt I used. It should be plain. It doesn’t have to be organic OR Greek. You can buy a little container because you only use a half cup. 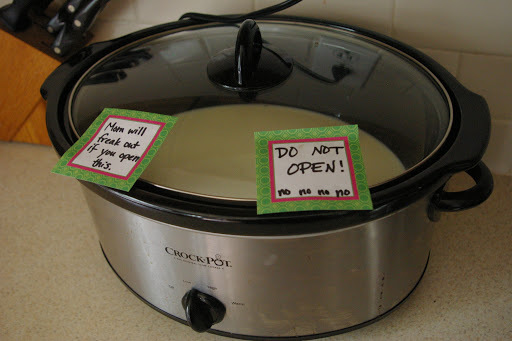 The last step, after you add the yogurt, is wrapping up your crock pot so it stays warm overnight. I wish I had a picture for you of this sight: a strange-looking mass of towel and blanket mounded on the counter. It’s pretty funny. And that’s it! The yogurt is a little runnier than storebought, but you can either add gelatin or powdered milk to combat that, or you can simply strain off some of the whey using coffee filters or cheesecloth. 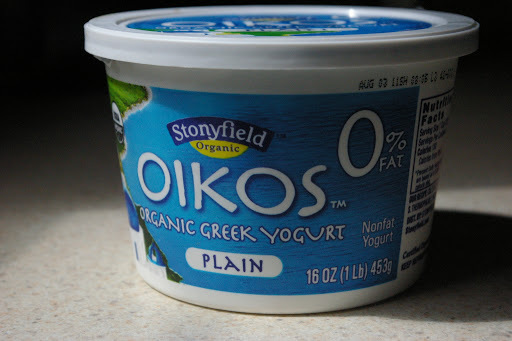 The price of this yogurt — organic, raw milk yogurt — was less than four dollars for a yield of two quarts and then some. If I were a good blogger I would have the price comparison here for you, but take my word for it that you can’t buy it that cheap. Here it is, folks: your chance to brighten up the long winter months with satisfying, heartening SOUP. There is a part of me that mourns the arrival of spring and summer because my meal planning no longer includes hot soup. There is no other option for our table that I can so easily stretch with a little extra water and a little extra rice or veggies. I’m going to give you one recipe today and then link to three more below. I will keep the linky open until Sunday night to give you plenty of time to link up. If you don’t have a blog, leave a comment with your recipe cut and pasted or linked from a recipe website! I almost always up the broth amount and add more veggies and barley. Do you have a kinder, more adaptable friend in the food world than soup? Who soothes you when you are ill? Who refuses to leave you when you are impoverished and stretches its resources to give a hearty sustenance and cheer? Who warms you in the winter and cools you in the summer? Yet who also is capable of doing honor to your richest table and impressing your most demanding guests? Soup does its loyal best, no matter what undignified conditions are imposed upon it. You don’t catch steak hanging around when you’re poor and sick, do you?